Bohuňovice is a village and municipality (obec) in Olomouc District in the Olomouc Region of the Czech Republic. The municipality covers an area of 12.57 square kilometres (4.85 sq mi), and has a population of 2,507 (as of 31 December 2017). 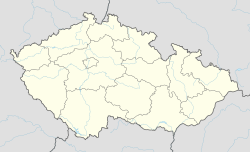 Bohuňovice lies approximately 8 kilometres (5 mi) north of Olomouc and 211 km (131 mi) east of Prague. This Olomouc Region location article is a stub. You can help Wikipedia by expanding it. This page was last edited on 1 March 2019, at 13:42 (UTC).